The Missive Maven: Pony Express postcard by Rifle Paper Co. I just received this adorable postcard today, from Carla of 365 letters blog. Squee! 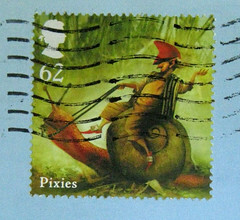 Love the cute pony express postman riding through a forest. Probably not terribly historically accurate to what the pony express was really like, but hey, it's so CUTE! The postcard is made by the Rifle Paper Co. but I've just been all over their website and can't spot it anywhere on the site. Can you? Edit: Thanks to blog reader and letter blogger Anne of Letter Love for spotting these postcards on the Paper Source website. Good mail day - thanks, Carla! that is awesome! I love everything about it! Glad to know the postcard is adorable as it looks online! 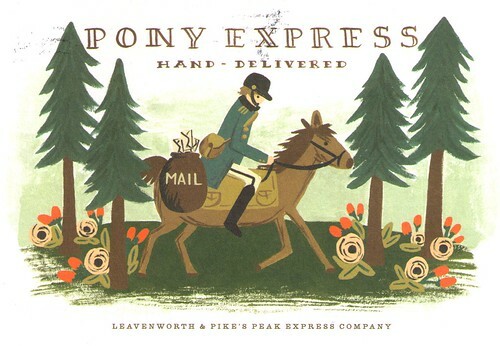 I've been admiring those for a while on Paper Source (http://www.paper-source.com/cgi-bin/paper/item/Pony-Express-Postcards/3902.040/587998.html). Maybe it's a PS exclusive? Anne, thanks so much for that link! The sender did indicate she purchased it at Paper Source, so you may be on to something. I'll edit my post now and credit you... and by the way, I just checked out your blog and linked it here, too. Amazing. Lately, I've been paper-crushing on the Rifle Paper Co goods something fierce. Well, historical accuracy can, indeed, be an impediment to cuteness. Yay for artistic license! And yay for mail ponies! Lady D - I think you've crafted a fine quotable quote: "Historical accuracy can, indeed, be an impediment to cuteness." Witty and true! Oh, I am glad you think so, Miss' Maven. That would be the only clever, useful thing I achieved that day. Feel free to give it a whirl wherever you find examples of cuteness shining through in spite of the tyranny of historical accuracy.